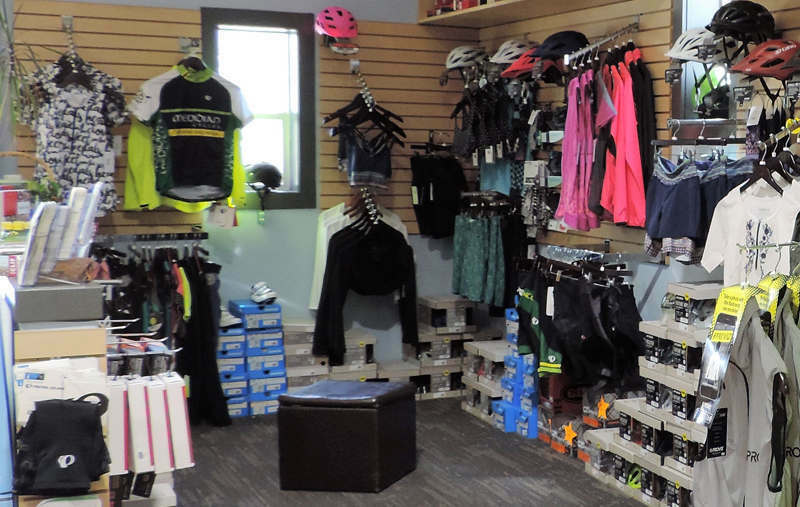 We carry a great selection of women's clothing from Pearl Izumi, Moxie, Club Ride, Louis Garneau, and special orders from Castelli, Terry, and Sheila Moon. Check out our Women's Brand Cycling Clothing, which we feel is some of the best in the industry. Meridian Cycles carries just what you need no matter what the riding season. Maybe you feel like you don't need the extra comfort and protection of cycling clothing, but the right clothing lends itself to helping create a truly positive experience. If you are serious about cycling you will research the brands of specialized clothing that are manufactured to specs that will add an indescribable comfort quotient to experiences that will turn into adventures. Men are not exempt when it comes to needing comfort when riding a hard race on a bike. Even an everyday average ride can take it's toll. Scraping, chaffing and fatigue are common ailments when cycling. Louis Garneau, Castelli, Pearl Izumi, Club Ride, Endura and Felt are some of the Men's Brand Cycling Clothing manufactured especially for the active cyclists. Meridian Cycles carries a great selection of cycling clothing. Shorts, Bibs, Jerseys (short and long sleeve) as well as gloves, shoes and jackets. Come in and check out our clothing and shoes. Cycling Clothing proves to be the most important accessory in cycling. If you're not comfortable with what you're wearing, you won't be as comfortable on the bike and won't have the desire to ride as far. There are a lot of styles and different jersey and short cuts out there, so it's important that you try before you buy! You may balk at paying what at first glance seems like a lot of money for a quality jersey and shorts, but if they truly are a quality product, they will last you for years! For full comfort on the bike, you really need a pair of good quality shorts with a great chamois, they will usually cost anywhere from $50.00 on up. As the price goes up, you're getting a more technically advanced product - temperature regulating fabric in the chamois, anti-microbial treatment, less seams to lessen any chance of irritation, and fabrics to help fend off fatigue. The same goes for jerseys, they start around $50.00 and the sky's the limit from there! Again, as you go up in price, you're getting a more technically advanced product: wicks moisture better, keeps you cooler (or warmer depending on the season! ), less seams, and MP3 pockets, just to mention a few of the upgrades. We've picked lines of clothing that we think are the best bang for the buck. Pearl Izumi, Castelli, Louis Garneau, Endura, Club Ride, and Moxie. Also, ladies, you don't have to buy online! We have a great selection of women's clothing in stock. So come on in, and see, feel, and try on so you're guaranteed the fit that you want without having to go through the hassle of returning through the mail. Also, we will special order if we don't have what you're looking for in stock.